Large rectangle tiles are a modern style of tile size and look contemporary on the wall or floor. They can be laid in line, brick-bond or subway off-set style and the longer styles can be laid in herringbone patterns. Available in matt or gloss, note that laying them length-ways will elongate a space and width-ways with widen your space. 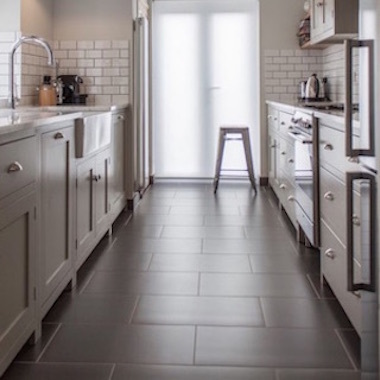 So if you have an alley-style of kitchen then buy these types of kitchen floor tiles, for example, consider laying them width-ways to add more width to your kitchen.